During the week of April 7-13th, Henderson Library will be celebrating National Library Week. 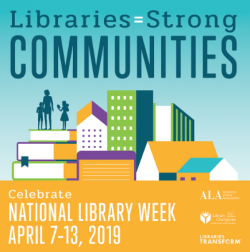 This week will focus on how Libraries can help strengthen communities. Our “National and State Parks of Georgia” exhibit is an example of this. The Government Documents department has displayed several parks that the community can visit. Our Library has a hub of resources that our patrons can easily find to decide which parks they want to visit and enrich their lives with the experience.